Now here's an obscure analog home video format! Video8 was introduced by Sony in the mid-80s as an 8mm cassette cartridge for their video camcorders. Once several standalone Video8 VCR decks became available; studios like Paramount, MGM/UA, and Warner began releasing pre-recorded movies on Video8 to capture those that also wanted to watch their personally recorded tapes. While the format thrived as a camcorder format until the dawn of digital, by the early '90s, it completely died as a viable home video format to video distributors much like the recent UMD. The cassettes first came in their own "mini-VHS" cardboard slipcases, but later arrived in the exact same plastic cases of traditional audio cassettes just without the two reel spindles. 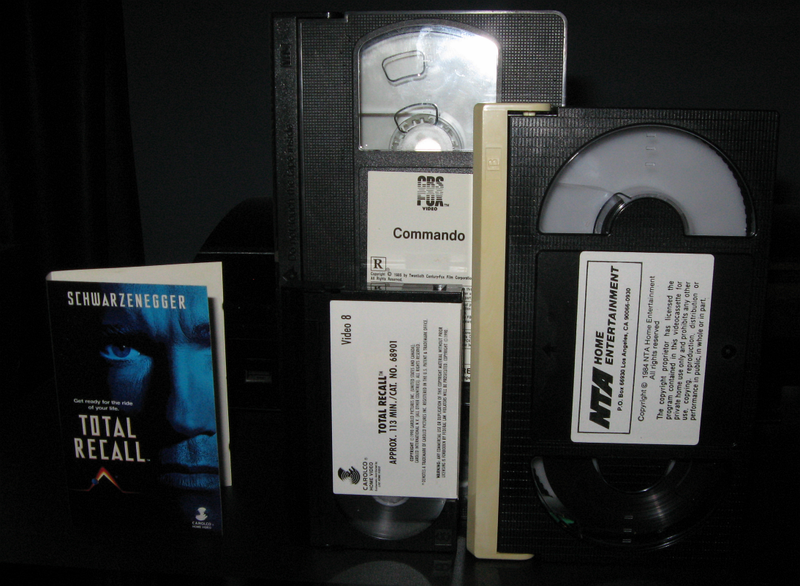 VHS and Betamax cassettes included to show scale. I have a friend who used to have stuff on this format. Another company who released on Video8 was Embassy (releasing titles such as Blade Runner and Labyrinth).